In a stunning setback for Republicans, the American Health Care Act was withdrawn on Friday, leaving the House and its leadership in disarray. Paul Ryan said, "Moving from an opposition party to a governing party comes with growing pains. And well, we're feeling those growing pains today." Our grassroots activism is a part of the pain that Congress is feeling! We will continue to rally and resist and demand accountability from our representatives. Our efforts are working and worthy of our time and energy! Keep it going! More on withdrawal of the health care bill in this New York Times Article. Tuesday's "Die In" at Issa's Vista office was a very effective protest. It received broad news coverage, including this article by The Huffington Post: Health Care Protesters Hold 'Die-In' Outside Darrell Issa's Office. Demonstrators held up tombstone-shaped signs with slogans like "GOP compassion killed me." See the article here. We will continue our Tuesday rallies at Issa's Vista Office. We want him to know that we still intend to hold him accountable for his words and actions. We will be asking Congressman Issa to take a leadership role in asking for a special prosecutor and an independent investigation into Trump's ties with Russia. 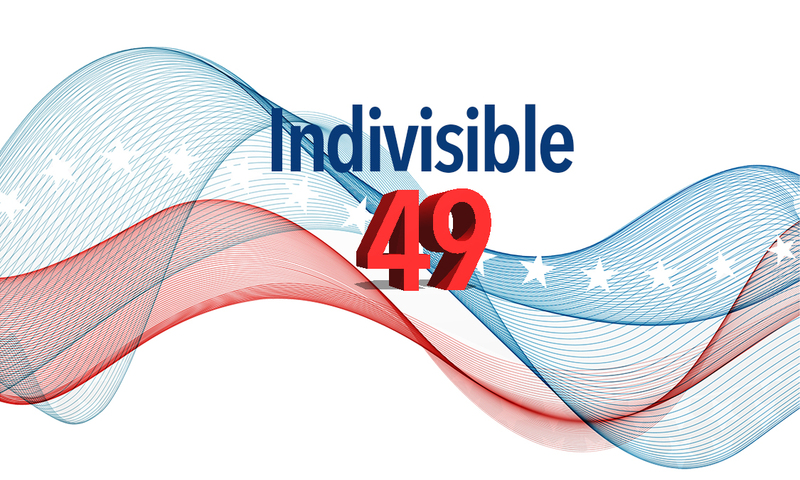 Come join us and meet other Indivisible 49 members as we share action plans! Rally info.